Hi everyone, just a very quick visit tonight to post this card for the Daisy May challenge. It's week 10 and I've just about made it as the new challenge begins tomorrow. This week's challenge was a lovely sketch. I've had a bit of a hectic week, which is why I haven't been about very much and I've missed visiting my favourite places lately, but I'm hoping to make up for lost time from tomorrow. I promised a dear friend that I'd try to join in with this challenge, but unfortunately this was the first chance I've had this week so I hope you like it, I'm not overjoyed with it myself, but as I made it from scratch in about 15 minutes, it's the best I could do. I'll see you all again soon, hopefully tomorrow when I should have a little more time. Thanks for your visit. Sorry Chrissie, I'm back again to say thanks for joining us at CDM - I'm so glad you made it. 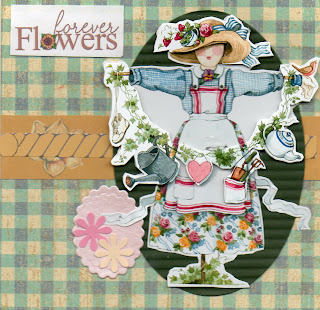 Fab card Chrissie - I am loving the PC Crafter images you are using! This card is so much fun, Chrissie! Fantastic! Love your card - you did so well coming up with it in such a short time. I can honestly say I've never made a card in fifteen minutes so for you to produce something like this in that time is amazing. It's a great take on the sketch and I love it. Your card is so cute Chrissie! Thanks so much for finding the time to join in with the challenge, you're a star!! There is nothing wrong with your card, I love the image and how you have used her.